, an eminent lawyer and judge, was the son of Thomas Price, esq of Geeler in Denbighshire, and born in the parish of Kerigy Druidion, Jan. 14, 1653. After an education at the grammar-school of Wrexham, he was admitted of St. John’s college, Cambridge; but, as usual with gentlemen destined for his profession, left the university without taking a degree, and entered himself a student of Lincoln’s Inn about 1673. In 1677 he made what was called the grand tour, in company with the earl of Lexington, and lady and sir John Meers. 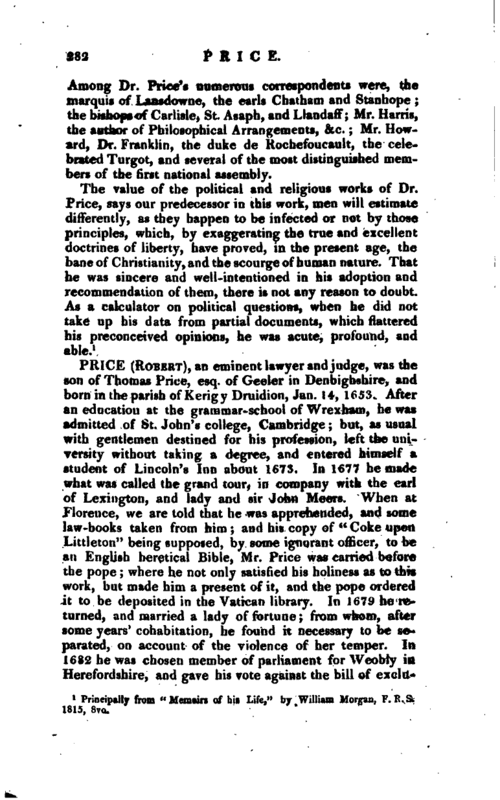 When at Florence, we are told that he was apprehended, and some law-books taken from him; and his copy of “Coke upon Littleton” being supposed, by some ignorant officer, to be an English heretical Bible, Mr. Price was carried before the pope where he not only satisfied his holiness as to this work, but made "him a present of it, and the pope ordered it to be deposited in the Vatican library. In 1679 he returned, and married a lady of fortune; from whom, after some years’ cohabitation, he found it necessary to be separated, on account of the violence of her temper. In 1682 he was chosen member of parliament for Weobly in Herefordshire, and gave nis hote against the bill of | exclusion. The same year he was made attorney-general for South Wales, elected an alderman for the city of Hereford, and the year following was chosen recorder of Radnor. His high reputation for knowledge and integrity procured him the office of steward to the queen dowager (relict of Charles II.) in 1684; he was also chosen townclerk of the city of Gloucester; and, in 1686, king’s counsel at Ludlow. 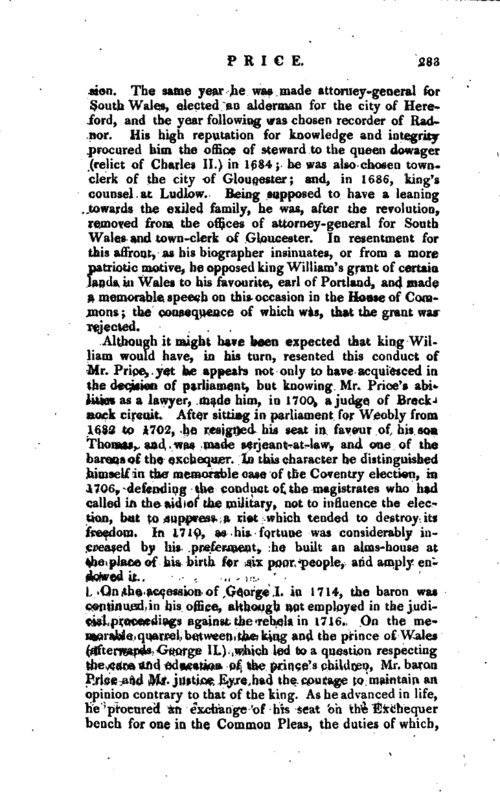 Being supposed to have a leaning towards the exiled family, he was, after the revolution, removed from tn*e offices of attorney-general for South Wales and town-clerk of Gloucester. In resentment for this affront, as his biographer insinuates, or from a more patriotic motive, he opposed king William’s grant of certain lands in Wales to his favourite, earl of Portland, and made a memorable speech on this occasion in the House of Commons; the consequence of which was, that the grant was rejected. Although it might have been expected that king William would have, in his turn, resented this conduct of Mr. Price, yet he appears not only to have acquiesced in the decision of parliament, but knowing Mr. Price’s abilities as a lawyer, made him, in 1700, a judge of Brecknock circuit. After sitting in parliament for Weobly from 1682 to 1702, he resigned his seat in favour of his son Thomas, and was made serjeant-at-law, and one of the barons of the exchequer. In this character he distinguished himself in the memorable case of the Coventry election, in 1706, defending the conduct of the magistrates who had called in the aid of the military, not to influence the election, but to suppress a riot which tended to destroy its freedom. In 1710, as his fortune was considerably increased by his preferment, he built an alms-house at the place of his birth for six poor people, and amply endowed it. Life, London, 1734-, 8vo. 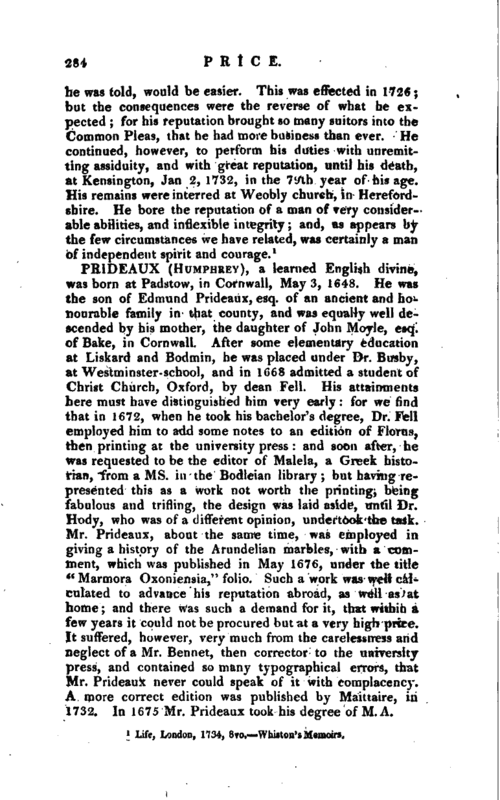 Whiston’s Memoirs.